LotusTalk - The Lotus Cars Community > Lotus Discussions > Powertrain (Engine, Transmission, etc) > Installed sportINSERTS! I just bought a rear insert kit, so thanks for the update. Did you have any issues getting the mount back into the bracket after pressing in the rear inserts? Did you have any issues getting the mount back into the bracket after pressing in the rear inserts? Last edited by driftwood; 05-20-2015 at 07:53 AM. Noticed both the vibration and the drastically improved shift accuracy after adding SportInserts. was looking at these, seems like a bargain for $50. How difficult is the install? can it be done DIY with a floor jack and hand tools? Yes, you can but it easier with a lift. I would say someone with average mechanical skills can do the job. Hi all - quick question on this job...re the rear mount inserts. I’m struggling to get the main 17mm bolt free, despite the nit on other side being removed. 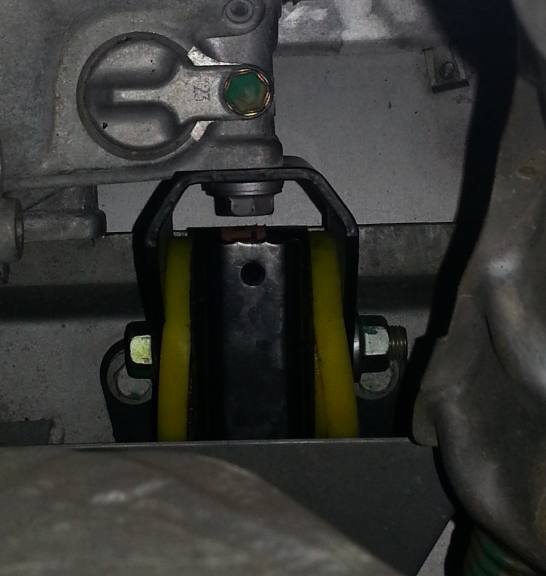 The mount itself is entirely off the subframe and it’s loose as you’d expect. Have tried heat, penetrating fluid etc. Anyone else have this problem & if so what was done to overcome? Hopefully you already figured this out but just in case... I just hammered the main bolt out (used a flat punch to drive it out of the hole). I did it with everything connected to the car. If you already have the whole thing out of the car, try putting it in a vice and just hammering it out. I just took mine off today for a clutch change, the bolts have been in there since about 2014. No problem getting them out, just tapped them with a hammer.